This page collects together content that was previously scattered around other pages of mine. March 2019: It is intended to include more details about what this technique involves and why it works even with unmodified DSLR and from light-polluted suburbia. My recent photos using narrowband filters on an unmodified Canon DSLR have been more successful than I had hoped. So I want to make clear why it works so well and why, in my opinion, it is better than getting the camera modified to extend its red range. As I have described elsewhere, the pixels in a DSLR all have coloured filters in front of them. 25% of them have a red filter, that allows through only light towards the red end of the spectrum. 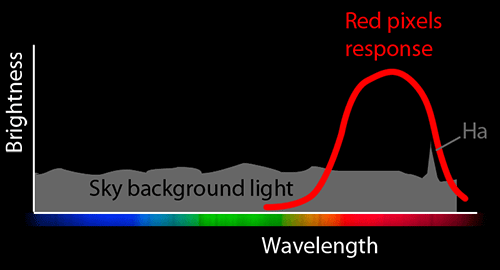 Light pollution, reflecting off dust in the air, covers the whole spectrum (all wavelengths) as shown in the following diagram. The filters in front of the red pixels integrate (more accurately, convolve with) the total shaded area under their response curve. If we are looking at a part of the sky that is emitting H-alpha light, the H-alpha peak is only an insignificant part of that shaded area and so is lost. In the next diagram we see what happens when a narrowband filter, designed to be centred on the H-alpha line, is also in the optical path. It cuts out all but the H-alpha peak, plus pollution in that range. So the hydrogen peak is now a significant part of the detected light. 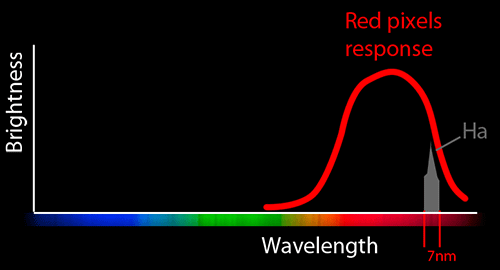 In Canon cameras (and probably other makes too) the response curve for the pixel red filters is down to about half its peak value at 656nm (the H-alpha wavelength). So it is necessary to use longer exposure times to detect H-alpha. If I had modified my camera to extend its range towards infrared I would be able to reduce exposure by about half but I would still need the narrowband filters, as I hope is clear from my diagrams. The filters are expensive but so is camera modification (unless you do it yourself, but that is risky). Filters alone have more effect than modifying the camera so I decided upon that route and I am pleased with the results so far (see the examples below). I also have a narrow (8.5nm) filter for doubly ionised oxygen (OIII). 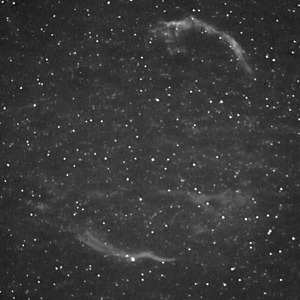 Many nebulae emit the 2 lines from OIII at 495.9 and 500.7nm which this filter is designed to cover. 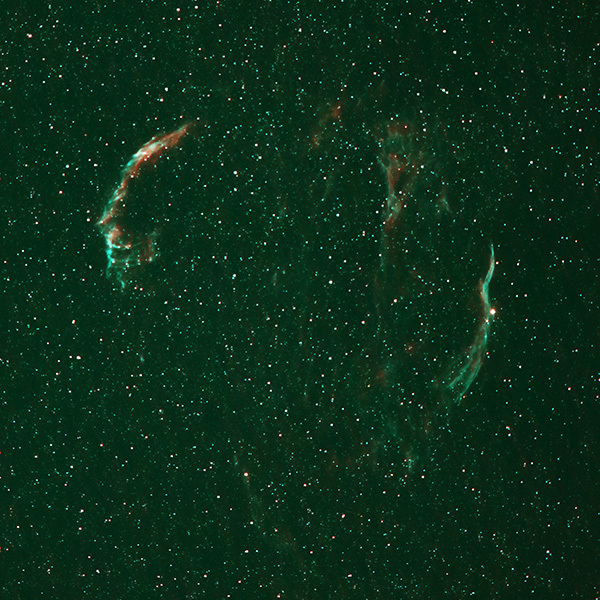 I have used it in a few of my images, such as of the Veil Nebula below. Having 3 colours would make it possible to use a different one of the RGB colour bands for each of them. One possibility would be to show SII in red, H-alpha in green and OIII in blue. Such things are done for images from the Hubble Space Telescope, for example. Some people call this the Hubble Palette but there are many variations, assigning different wavelengths to different bands for display. This is not just done for a pleasing appearance; it can help to make fine details visible. Another H-alpha photo taken with unmodified DSLR from light-polluted suburbia. I have combined this with a shorter set of exposures in normal light for the foreground stars. The Heart Nebula (IC1805) is conspicuous. 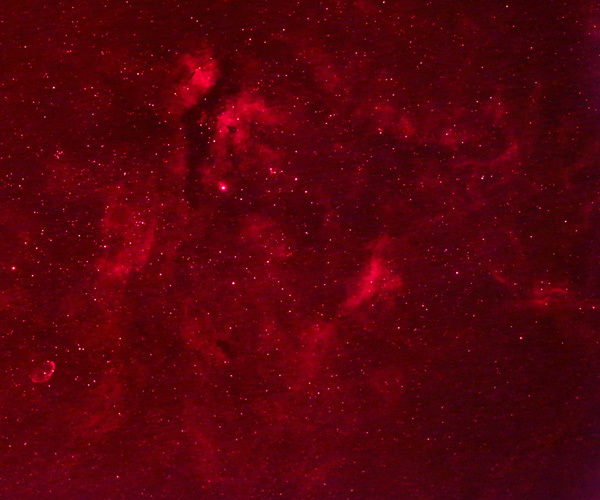 Above it is the Soul Nebula (Westerhout 5). 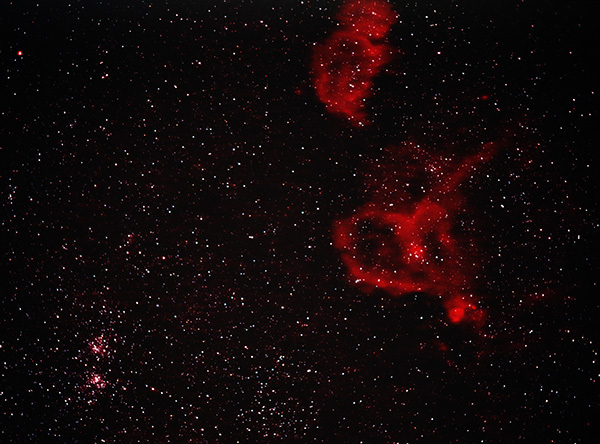 Bottom left is the Perseus double star cluster (NGC 869 & 884). 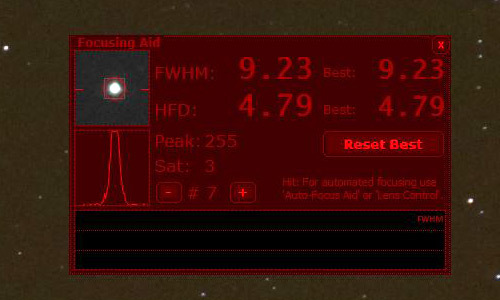 Another image obtained from light-polluted suburbia with an unmodified Canon DSLR by using a narrowband H-alpha filter. To the left is the Rosette Nebula in Monoceros. 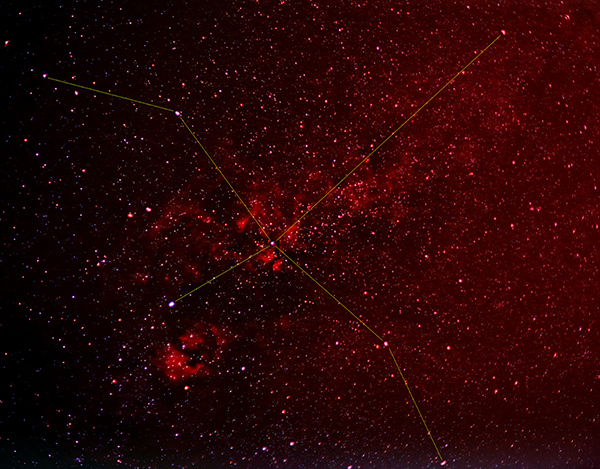 Clearly visible on the left side of Orion is the main part of Barnard's Loop. Hydrogen around the Flame and Horsehead nebulae is bright, as is M42. Fainter is the disc (sphere?) 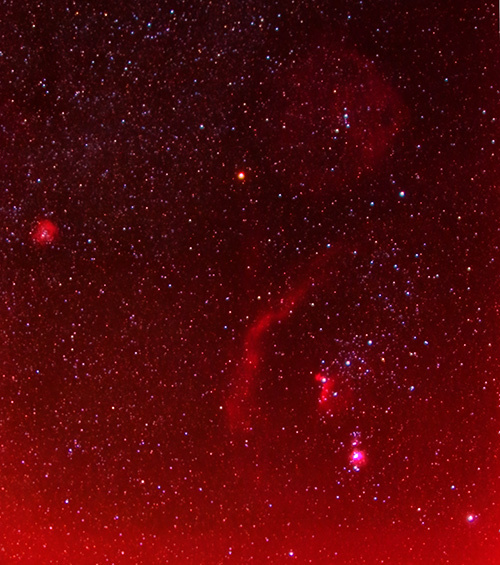 of hydrogen around Orion's head. The brightness along the bottom of the picture is from continual cloud/haze near the horizon. Orion never rises very high in the sky here. I used GRIP to align the 2 images accurately and add them together, 50% of each. 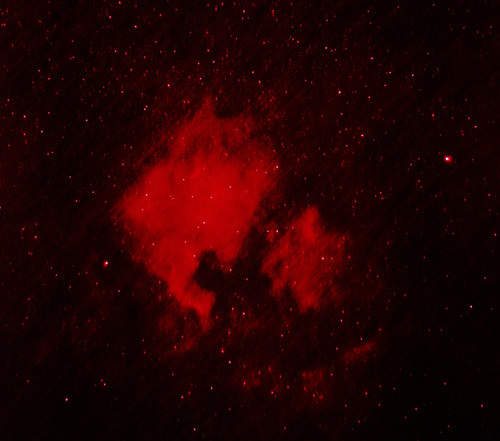 At the bottom is the Heart Nebula and I am delighted that it shows up so clearly. 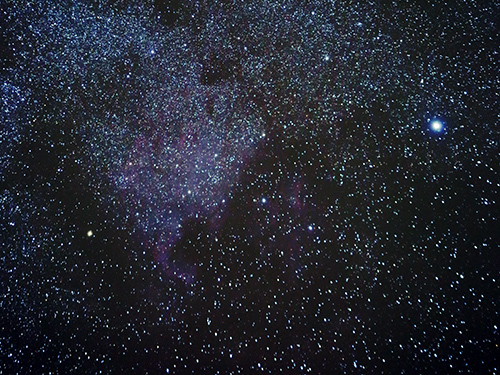 To its right is the Perseus double star cluster. Below the middle of the W is NGC281, the PacMan nebula. I have not yet identified the nebulae in the upper half of the image. This is just another view similar to those from recent photos, below, except that it luckily covers the whole of the main part of Cygnus. I have inverted the image (north is bottom left) to make clearer the reason why the constellation is said to represent a swan. Colours as shot: red for hydrogen, green and blue for oxygen. My previous attempts to photograph this nebula from the darkness of Weardale using a 10inch Newtonian pale into insignificance compared to this. I am really just discovering the delights and power of narrow band filters. That is only part of the view. Gamma Cygni is the bright star near the centre. North is diagonally up and right. In the bottom left the Crescent nebula (NGC6888) is clearly visible. I did also take an OIII exposure. 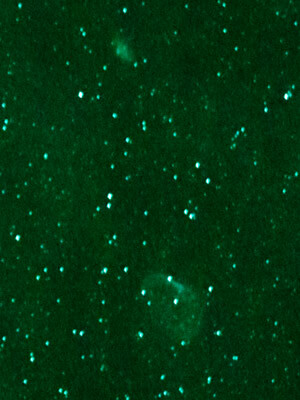 Only the crescent nebula and a small area to its north showed up in OIII. These images were processed by my GRIP program using its "medianising" method. This is a 2-stage process. "Batch/Astro/Astro warp/shift onto common basis" aligns the images but does not stack them. Instead it saves them in new files (FITS or TIFF, depending on what you input). "Batch/Astro/Create median pixels image" goes through those files (in multiple slices, depending on how much RAM you have available) and for every pixel it makes a list of its values in all the images, sorts the list and takes the median value. It builds one image containing the median values. On my laptop with 8Gbytes of RAM (not unusual these days) the process only takes about twice as long as more straightforward stacking. This produces a better result than stacking because it exploits the fact that the drive in the equatorial mount is not perfect: images can be displaced from each other by a few pixels. GRIP even shows a graph and spreadsheet of the displacements during the process. Taking the median value for each pixel avoids extremes such as are caused by hot pixels, which are thereby eliminated altogether (not just watered down as would occur in stacking). This also tends to reduce fixed-pattern noise from the detector which can become troublesome at high ISO values such as 25600. I saved each result as 16-bit TIFF and then opened it in Photoshop (CS4) mainly to use unsharp masking (Filter/Sharpen/Unsharp mask). I use the biggest possible radius (250px) at 100%. This enhances details while lowering large-scale variations. Photoshop's implementation of this tends to make the image brighter so that some highlights may burn out, in which case it is necessary to darken the image before unsharp masking, then perhaps brighten it again afterwards. No dark frames or flat frames were used. I have written a page about that here. Have a cheap hairdryer available when taking the photos! In the few seconds between exposures blow it gently over the front of the lens or filter. This prevents dew forming (and frost on colder nights). NB: From light-polluted suburbia with an unmodified Canon DSLR. H-alpha (red). This transmits a 7nm band centred on the Balmer series line at 656.28 nm, giving us a map of neutral hydrogen. 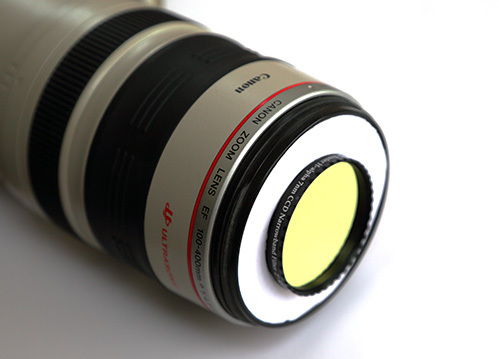 The filter is 50.8mm diameter and so it reduces the focal ratio of the 200mm lens at its widest to 200/50.8 = f/3.9. It causes significant vignetting on this lens, which it did not on the 50mm lens (not a surprise). OIII (green). This shows doubly-ionised oxygen by only letting through 8.5nm around the "Nebulium" lines at 495.9 nm and 500.7 nm. This filter is 65mm square but after mounting in a home-made holder the square aperture is 62mm. A little geometrical calculation convinced me that this reduces the focal ratio of the fully open 200mm lens only to f/3.0. I managed to get short sequences through each filter to produce the following when stacked in GRIP. All I can say is that, considering how short the total exposure times were, this is a good start and I should easily be able to do better when there is a properly clear night. Continuing my experiments with a narrow band filter, this was again taken from a light-polluted site with an unmodified DSLR. Furthermore the Moon was up - gibbous, only 2.5 days past Full, but about 90° away from my target area. 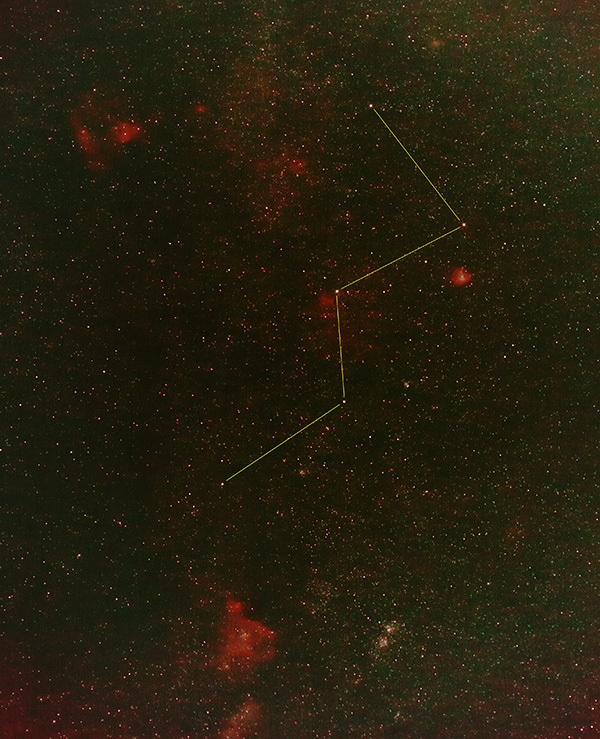 We see here a map of neutral hydrogen in the northern part of the constellation of Cygnus. 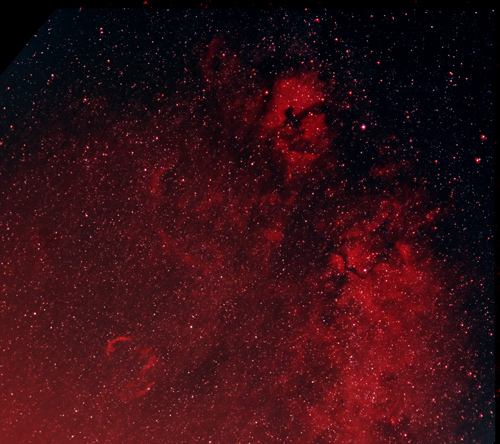 The brightest star in the top right quadrant of the image is Alpha Cygni. 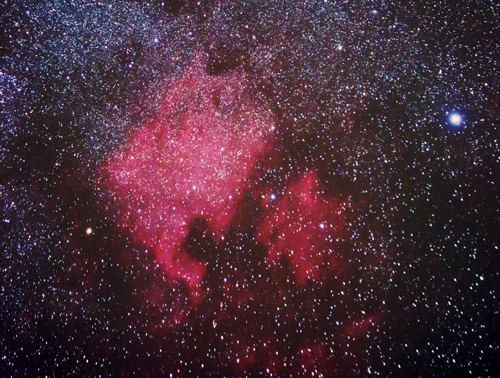 To the left of that and slightly up lies the North America Nebula and the Pelican Nebula, as I photographed in more detail last month (below). Down (southwards) from Alpha Cygni the next bright star, Gamma Cygni, has further hydrogen clouds around it and the hydrogen extends further southwards, along the Milky Way. 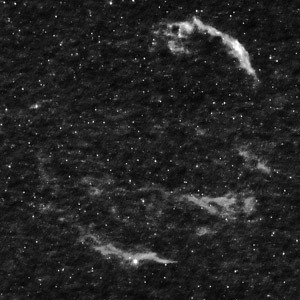 Clearly visible to the left (eastwards*) lies the Veil Nebula. This is the remnant of a supernova explosion several thousand years ago. *Remember that east and west are reversed when we look upwards, as compared to looking down at a terrestrial map. I am absolutely delighted that I am able to do this with my unmodified DSLR but I think this may upset some people who have paid to have their cameras modified. As I have noted before, the H-alpha emission line lies on the downward slope of the camera's built-in IR filter, such that the camera is only half as sensitive at this wavelength - ie, 1 photographic stop (1 EV) down - and we can compensate for that by increasing ISO sensitivity and/or exposure time. 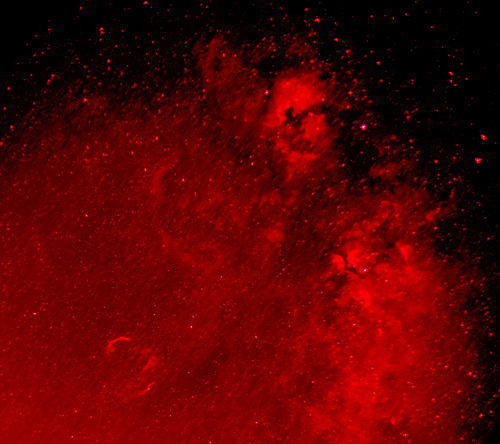 Notice that some stars appear to be white, despite the narrow red filter. The same occurred on the previous image (Sep 6, below). It is because the brightest stars overfill their pixels with electrons. Charge then overflows into neighbouring pixels. The neighbours of red pixels on the detector are green and blue. So when the RAW image is interpolated to make an RGB image white is formed by the overflows. A larger version can be seen on my Flickr page (click on the thumbnail image there). Exposure control was done by APT software running on my laptop, connected to the camera by a USB cable (5m boosted cable as an extension to Canon's supplied USB cable). I recently upgraded to the latest version of APT and used its focussing aid to get a sharp focus on the stars, which was easy to use and worked very well. I thoroughly recommend APT. The background here is a live image (but several frames integrated, for brightness). The dialogue is dragged over a bright star and a graph of its profile is shown along with some measurements. FWHM is Full Width at Half Maximum (of the profile) and that measurement needs to be minimised. That can be done quite effectively by slowly turning the focus ring on the lens (set to manual) while holding the laptop alongside the camera. Then, being already conected to a long USB cable, I move the laptop indoors, where I can sit in comfort to set the exposures going and watch each result. I always put some tape over the focus ring when focus is reached, so it cannot move. Heavy zoom lenses tend to slip when looking upwards: tape the zoom ring too. This was taken from a light-polluted site with an unmodified DSLR. Having lost my dark observing site in the North Pennines, I am experimenting to see how difficult deep-sky objects might still be photographed from light-polluted suburbia. I purchased a Baader narrowband H-alpha interference filter. It transmits only a 7nm wide band around the Hydrogen-alpha line at 656nm. These filters are produced in circular holders designed to fit in front of astronomical eyepieces and so they have diameters of either 1.25 inches (3.175mm) or 2 inches (5.08mm). I obtained one of the larger size and cut some thick mounting card to hold it in the 77mm diameter filter ring of a lens (I have 2 lenses with that size filter ring). This year I have also upgraded my camera from 5D Mk2 to 5D Mk3. That gives me 2 further stops of sensitivity: the maximum non-extended ISO setting is 25,600. So in this first experiment I have used half-minute exposures at f/5 and that highest ISO setting. 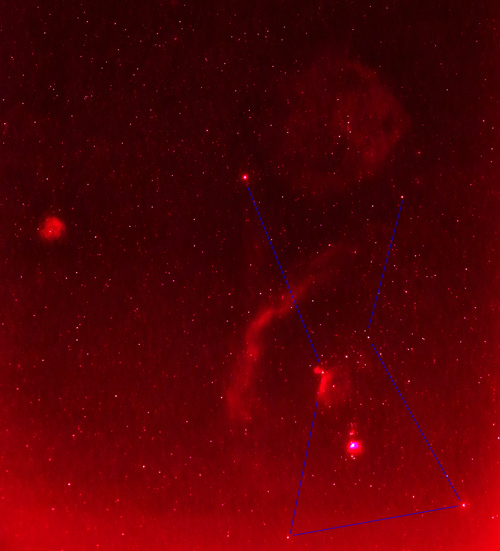 I am pleased to see that although the H-alpha line falls at the edge of Canon's detector range, where the sensitivity is already reduced by a half (as I investigated here), I can photograph not only the main part of the North America Nebula (NGC7000) but also the neighbouring Pelican Nebula (IC 5067 & IC 5070) and other hydrogen clouds to the south of those. All without modifying my camera and, furthermore, from light-polluted Tyneside. After taking the H-alpha exposures to make the image above, I carefully removed the filter from in front of the lens and took some more exposures in normal light. As expected the light pollution prevented the nebulae from being seen in the result. However after further processing to enhance it I obtained the following image. Most of the nebulosity visible here is due to gases other than hydrogen, so the shapes are different. Compare with my earlier photos of NGC7000 here. I carefully cut circles in mounting card with a knife to get snug fits both of the filter in the card (it screws in) and the card into the filter thread on the front of the lens. Page new 2019 Mar 30.